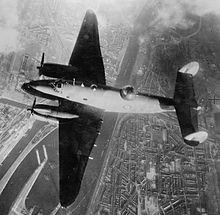 The Lockheed Ventura was a bomber and patrol aircraft of World War II, used by United States and British Commonwealth forces in several guises. It was developed from the Lockheed Model 18 Lodestar transport, as a replacement for the Lockheed Hudson bombers then in service with the Royal Air Force. Picture - A USAAF B-34-VE in 1943. The Ventura was very similar to its predecessor, the Lockheed Hudson. The primary difference was not in layout; rather, the Ventura was larger and heavier than the Hudson. The RAF ordered 188 Venturas in February 1940. They were delivered from mid-1942 onwards. Venturas were initially used for daylight raids on occupied Europe. They proved unsuited to this task, because (like many other bombers used by the RAF), they were too vulnerable without long-range fighter escorts. They were replaced in this role by the de Havilland Mosquito. 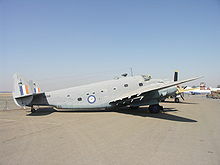 The Venturas were gradually transferred to patrol duties with Coastal Command, 30 went to the RCAF and some to the SAAF. The RAF placed a further order for 487 Ventura Mark IIs, but many of these were diverted to United States Army Air Forces service. The U.S. Army Air Forces placed its own order for 200 Ventura Mark IIA, which were put into service as the B-34 Lexington. Later redesignated RB-34. In 1941 August, large orders for Venturas were placed with Lend-Lease Act money. Among the orders were for 550 armed reconnaissance versions of the Ventura. This plane was originally planned to be built under the designation O-56. The main differences between the Ventura and the O-56 were in the engines: rather than the 2,000 hp (1,491 kW) Pratt & Whitney R-2800 radials of the Ventura, the O-56 used 1,700 hp (1,270 kW) Wright R-2600-13 radials. Before completion of the first O-56, the U.S. Army Air Forces dropped the O- category used to designate 'observation' (reconnaissance) planes. The O-56 was redesignated the RB-34B (RB- for 'reconnaissance bomber'). Before the first of these flew, the design was redesignated again as the B-37, because it used different engines. RB was not used for Reconnaissance until after 1947. F was used for photo rec. R was used for Rotorcraft, which was changed to H for Helicopter after 1947. The RB designation WAS eventually given to these aircraft to represent a Redesignation - in this case to a training role. While 550 were ordered by the Army Air Forces, acquisition by the USAAF stopped after only 18 were accepted, when the Army Air Forces agreed to turn over exclusive use of the Ventura to the United States Navy. 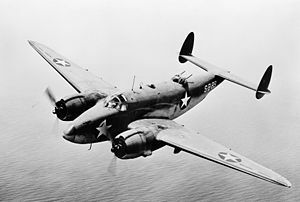 The PV-1 Ventura, built by the Vega Aircraft Company division of Lockheed (hence the 'V' Navy manufacturer's letter that later replaced the 'O' for Lockheed), was a version of the Ventura built for the U.S. Navy (see Venturas in U.S. Navy service below). The main differences between the PV-1 and the B-34 were the inclusion of special equipment in the PV-1, adapting it to its patrol-bombing role. The maximum fuel capacity of the PV-1 was increased from 1,345 gal (5,081 l) to 1,607 gal (6,082 l), to increase its range; the forward defensive armament was also reduced for this reason. The most important addition was of an ASD-1 search radar. The PV-1 began to be delivered in 1942 December, and entered service in 1943 February. The first squadron in combat was VP-135, deployed in the Aleutian Islands in 1943 April. They were operated by three other squadrons in this theatre. From the Aleutians, they flew strikes against bases in Paramushiro and Shimushu, Japanese islands in the Kurile chain. Often, PV-1s would lead B-24 bomber formations, since they were equipped with radar. 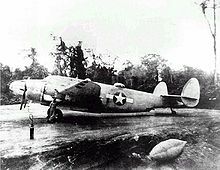 In late 1943, some PV-1s were deployed to the Solomon Islands as night-fighters. The PV-2 Harpoon was a major redesign of the Ventura with the wing area increased from 551 ft� (51.2 m�) to 686 ft� (63.7 m�) giving an increased load-carrying capability. The motivation for redesign was weaknesses in the PV-1, since it had shown to have poor-quality takeoffs when carrying a full load of fuel. On the PV-2, the armament became standardised at five forward-firing machine guns. Many early PV-1s had a bombardier's position, which was deleted in the PV-2. Some other significant developments included the increase of the bombload by 30% to 4,000 lb (1,800 kg), and the ability to carry eight 5-inch (127 mm) HVAR rockets under the wings. Ex-military PV-1 Venturas from Canada and South Africa were converted by Howard Aero in San Antonio, Texas in the 1950s and 60s as high-speed executive transports. The earliest conversions, called Super Venturas, incorporated a 48 in (122 cm) fuselage stretch, extra fuel tankage, large picture windows, luxury interiors, and weapons bays transformed into baggage compartments. The landing gear was swapped for the heavier-duty units from the PV-2. Later versions, built in the 1960s, were called Howard 350s. At least fifteen PV-2s were further modified, including cabin pressurisation under the designation Howard 500. A final PV-1 modification by Howard was the Eldorado 700, with longer wings, a pointed nose, and streamlined engine cowlings. Picture - A No. 21 Squadron RAF Ventura attacking IJmuiden, February 1943. 387 PV-1s were used by the RAF as the Ventura G.R.V. They were used in the Mediterranean and by Coastal Command. Some RAF aircraft were modified into Ventura C.V transport aircraft. The Ventura Mark I was first delivered to the Royal Air Force in September 1941, and flew its first combat mission on 3 November 1942 against a factory in Hengelo, the Netherlands. On 6 December 1942, 47 Venturas engaged in a daylight, low-altitude attack against Eindhoven, also in the Netherlands. This was the primary event that demonstrated the Ventura's weakness in such raids: of the 47, nine of the bombers were downed. Following this tragedy, tactics were switched to medium-altitude raids. The Ventura fared little better in this strategy. During one attack on a power station in Amsterdam on 3 May 1943, New Zealand's 487 Squadron was told the target was of such importance that the attack was to be continued regardless of opposition. All ten Venturas to cross the coast were lost to German fighters. Squadron Leader Leonard Trent, (later the last of the Great Escapers), won the Victoria Cross for his leadership in this raid. It was never a very popular aircraft among RAF crews, and despite the fact that it was 50 mph (80 km/h) faster and carried more than twice as many bombs as its predecessor, the Hudson, it proved ill-suited to its task as a bomber. By the summer of 1943, the Ventura had been phased out of service in favour of the de Havilland Mosquito. Its last mission was flown by No. 21 Squadron RAF on 9 September 1943. After leaving bombardment service, a number were modified to be used by Coastal Command; they served as the Ventura G.R.I. A total of 55 PV-1s were used by the RAAF in the South West Pacific Area, serving primarily in New Guinea. Initially, air crews and ground staff disliked the Ventura, preferring the B-25 Mitchell. But in many cases, the PV-1 had developed a grudging respect from its operators. Venturas were in use by the RCAF from 16 June 1942 to 18 April 1947 in the home defence coastal patrol role in both Eastern and Western Air Command. They were flown by 8, 113, 115, 145, and 149 Squadrons, as well as by 1 Central Flying School, Trenton, Ontario, and at RCAF Station Pennfield Ridge, New Brunswick (RAF No. 34 Operational Training Unit). They were also flown at RCAF Station Yarmouth in World War II. A total of 21 Mk. Is, 108 Mk. IIs, and 157 G.R. Mk. Vs were in service during this period for a total of 286 aircraft. The South African Air Force also received some 135 PV-1s, which were used to protect shipping around the Cape of Good Hope, and to bomb Italian shipping in the Mediterranean. They were used by the South African Air Force up to 1960. The Royal New Zealand Air Force in the Pacific received 139 Venturas and some Harpoons from June 1943 to replace Lockheed Hudsons in the maritime patrol bomber and medium bomber roles. Initially Venturas were unpopular with the RNZAF due to rumoured poor performance on one engine, the fate of Squadron Leader Leonard Trent VC's 487 Squadron (above) as well as the failure of the U.S. to provide New Zealand with promised B-24 Liberators. Despite that the RNZAF Venturas came to be amongst the most widely used of any nation's, seeing substantial action until VJ Day over South West Pacific islands. The first 19 RB-34s that arrived by sea from the U.S. in June had much equipment either missing or damaged. Six airworthy machines were hurriedly produced by cannibalisation and sent into action with No. 3 Squadron RNZAF in Fiji. On 26 June the first PV-1s were flown to Whenuapai and No. 1 Squadron RNZAF was able to convert to 18 of these by 1 August, then replacing the mixed 3 Squadron in action at Henderson Field, Guadacanal in late October. RNZAF machines often clashed with Japanese fighters, notably during an air-sea rescue patrol on Christmas Eve of 1943. NZ4509 was attacked by nine Japanese single-engined fighters over St. George's Channel. It shot down three, later confirmed, and claimed two others as probables, although it suffered heavy damage in the action. The pilot, Flying Officer D. Ayson and navigator, Warrant Officer W. Williams, were awarded the DFC. The dorsal turret gunner Flight Sergeant G. Hannah was awarded the DFM. By late 1944 the Ventura began to be phased out of frontline action as the RNZAF backed away from the Patrol Bomber concept, orders for PV-2 Harpoons were cancelled after a handful or aircraft had been delivered. At VJ Day only 30 PV-1 aircraft remained on the front-line with No. 3 Squadron at Jacquinot Bay. Planned re-equipment with Mosquitoes did not take place until after the cessation of hostilities. The last Ventura unit was No. 2 Squadron, which continued to operate PV-1 and PV-2 aircraft on meteorological duty until 1948. A restored RNZAF RB-34 (NZ4600) is owned by the Museum of Transport and Technology in Auckland. Picture - PV-1s of VPB-147 in the Caribbean in 1944. During the early months of 1942, the primary responsibility for anti-submarine warfare in the United States was shouldered by the Army Air Force. This irked the Navy, as it considered this region of battle its burden. To carry out such a task, the Navy was pursuing a long-range, land-based patrol and reconnaissance aircraft with a substantial bombload. This goal was always resisted by the Army Air Force, which carefully protected its monopoly on land-based bombing. This forced the navy to use long-range floatplanes for these roles. The Navy was unable to upgrade to more capable aircraft until the Army Air Force needed the Navy plant in Renton, Washington to manufacture its B-29 Superfortress. In exchange for use of the Renton plant, the Army Air Force would discontinue its objections to Naval land-based bombers, and provide planes to the Navy. One of the clauses of this agreement stated that production of the B-34 and B-37 by Lockheed would cease, and instead these resources would be directed at building a navalised version, the PV-1 Ventura. Picture - PV-2s of VPB-136 at NAS Whidbey Island, 1945-46. After the war the US Navy deemed many PV-1s as obsolete and the aircraft were sent to Naval Air Station Clinton, Oklahoma to be demilitarized and reduced to scrap. Picture - One of 18 USAAF B-37s, 1943. US designation for the Model 137 (with 2000hp R-1820-31 engines) bought for the Royal Air Force, 200 built and designated the Ventura IIA by the British. Lockheed Model 437 for the USAAF (with 2000hp R-2600-13 engines), only 18 out of an order of 550 built for armed observation. Originally designated the O-56, it was later designated the RB-37. Picture - A PV-3 in early 1943. It was assigned in October 1942 to VP-82 which operated from Newfoundland on anti-submarine patrols over the Atlantic. Picture - A USMC PV-1 night fighter from VMF(N)-531 in the Solomons, 1943. A PV-1 is currently undergoing restoration by the Sanford Airport Memorial Committee for eventual display at the NAS Sanford Memorial Park at Orlando Sanford International Airport, formerly Naval Air Station Sanford from 1941-1968. The aircraft was located by and is on loan from the National Museum of Naval Aviation at NAS Pensacola, Florida. A Ventura GR.V (RCAF #2195, CF-FAV), owned by the Ventura Memorial Flight Association, is undergoing restoration at the Alberta Aviation Museum in Edmonton. A B-34 Lexington is on open air display at the South African Air Force Museum, Pretoria, construction number 4642. A RB-34A version is on display at the Museum of Transport and Technology, Auckland, New Zealand. This Lexington has a USAAF serial number of 41-38117, but the Royal Air Force designated it with FD665; where it served in North Africa. The RAF later transferred the aircraft to the Royal New Zealand Air Force where it was given serial NZ4600. PV-2 Harpoon BuNo 37257 is on display at the Pima Air and Space Museum in Tucson, Arizona. A PV-2D with miscellaneous modifications is on display at the Lone Star Flight Museum, Galveston, Texas, USA. Serial number 37634. The Palm Springs Air Museum recently acquired a PV2 Harpoon and will be displaying it pending completion of the plane's restoration. A PV-2D is resting on the bottom of Lake Washington. Roberts, Michael D., Captain, MSC, USNR (Ret. ).Dictionary of American Naval Aviation Squadrons, Volume 2: The History of VP, VPB, VP(H) and VP(AM) Squadrons. Washington, DC: Naval Aviation History Office, 2000. Lockheed Ventura Pictures and Lockheed Ventura for Sale.